“CPA Conversion Crusher”, by Abul Hussain and found at cpaconversioncrusher.com/special/index.html, is a very short CPA Marketing Training Video, (a pay per view YouTube lesson, yet), combined with costly upsells, that offers a lesson on a method of profiting from CPA offers. The CPA Conversion Crusher video lesson is about a half hour and initially goes for $4.95 through Warrior Plus shopping cart. However, the rub is that CPA Conversion Crusher will inundate you with one upsell after another very shortly thereafter. The biggest upsell goes for almost $150 for some business coaching program. We here at ScamXposer know what that may mean. Usually these business coaching programs are just a jumping off point for far more expensive coaching upsells that really won’t do much for you. The method that CPA Conversion Crusher teaches on the initial video involves creating a system that lists your keyword targeted websites, monthly traffic and keywords so you can choose where to advertise. Once you choose the sites you advertise on them. For example, if you’re promoting beauty products you use beauty aids as your keyword on CPA Conversion Crusher’s system. 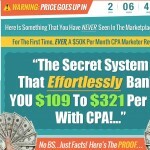 CPA Conversion Crusher then spits out a list of beauty aids websites along with their traffic. Then you can get a hold of the site owner and negotiate ads prices to buy, create the ads, etc. You can begin to see what an ordeal it can be to deal with the CPA Conversion Crusher system. There’s no guarantee on sales boosts, etc. This is not an easy system to use, especially for beginners. There is a lot of extra work that must be done and if you don’t know how to do it then CPA Conversion Crusher could be a big waste of money. What it comes down to is that CPA Conversion Crusher is only a small part of a lot of work in order to make any money, if you can actually make it. This not the easy one click push button system the owners of CPA Conversion Crusher make it out to be and you must have good knowledge of advertising and excellent negotiation skills. You will also need a lot of money to sink in for buying ad space, and other components and plugins to use in coordination with CPA Conversion Crusher. So, before you even can make any money you are already hundreds of dollars into trying to make things work as long as you know how to make them work in your favor. There are far better programs out there than CPA Conversion Crusher that have all the tools to earn money online from home. This is only one component and is not a complete package. Some have complained that the component CPA Conversion Crusher sends you won’t function properly and some say they never received their instant download. According to several unhappy customers, there seems to be no customer service when they have tried to get help from CPA Conversion Crusher. Since CPA Conversion Crusher leaves you to the wolves, then it is definitely not for beginners. CPA can get tricky and if you don’t have support and help from a business you engage with that’s a problem. It is a bit strange to charge to see a YouTube video, even if it is a private link, but the video is only a little over 30 minutes. There cannot possibly be very much you can learn in a half hour video that can justify the five bucks CPA Conversion Crusher charges for it. There is a lot of information available elsewhere for either free or as a complete system with serious lessons than CPA Conversion Crusher, and a better affiliate side than them as well. The one thing I can say for CPA Conversion Crusher is that if you already know how to make your own ads, negotiate with site owners on ad pricing and bumping other ads for yours and knowing how to get traffic and more, than you might just be able to get use out of it. However, a complete system elsewhere would give you better advantage, and if you’re already good at marketing, this might not be as useful to you or worth paying for their many dicey upsells. At least the owner does say he assumes you know how and what to promote and how to drive traffic to your site so from the start he admits CPA Conversion Crusher is not for the newcomers. I did find the photo of him with a kid, whether it’s his or an actor, to be kind of smarmy alongside his partners Billy Darr, Zman and, Venkata. Hyping one small component of a real system only to try and get people to spend more once you join is also a poor plan. This is not a complete system, I say again. There are better ways to learn about CPA ads and CPA offers. Since intermediate to advanced marketers could earn from CPA Conversion Crusher if they put a lot of time into it, I won’t call it a scam. However, I do not recommend CPA Conversion Crusher as a useful tool, or even wasting 5 bucks on their short YouTube video.